Visit is part of Israeli policy of seeking allies among developing countries that historically sided with Palestinians. Israel’s prime minister has departed for the central African nation of Chad to officially restore relations. Benjamin Netanyahu on Sunday hailed what he called a “historic and important breakthrough” with the Muslim-majority country that borders Libya and Sudan. Chad’s President Idriss Deby visited Jerusalem in November. Netanyahu has made great efforts to extend Israeli diplomacy to Africa and has visited the continent several times in recent years. It’s part of an overall policy of seeking allies among developing countries that have historically sided with the Palestinians at the UN and other international forums. Netanyahu says this outreach “causes outrage in Iran and among the Palestinians”. Chad broke off relations with Israel in 1972. It plays a key role in combatting armed groups in the Sahara. Deby’s visit to Israel was the first by a leader of the Central African country that severed diplomatic ties with Israel in 1972. Netanyahu previously pledged to strengthen ties with the continent and described his pledge as a “priority” at a regional security conference he attended in Liberia in 2017. Israel maintains diplomatic ties with 32 of the continent’s 54 countries. Deby said his November visit was “historic” for both countries and that it “could facilitate the turning of a new page in relations between us” but added that even with a renewal of ties, the Israeli-Palestinian conflict could not be ignored. “Of course, the renewal of diplomatic ties between us, which I very much want, is not something that can make the Palestinian issue disappear,” Deby said in Jerusalem. 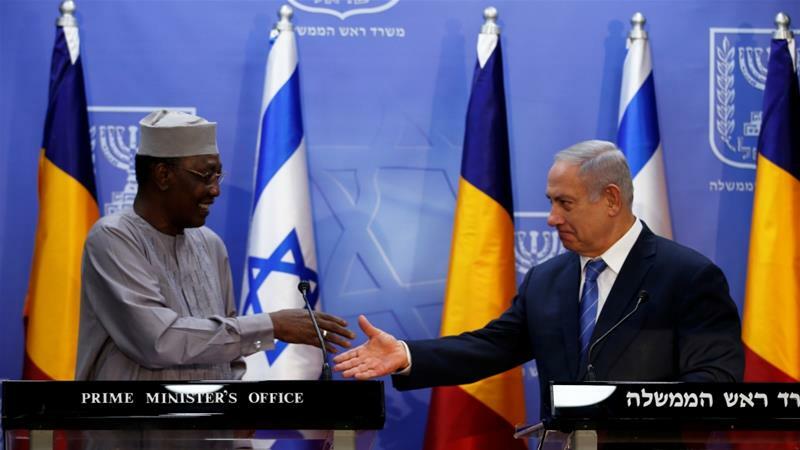 Unofficial contacts between Israel and Chad have been ongoing for an extended period, Deby said. One source told Reuters news agency the visit is focused on security, adding that Israel has supplied Chad’s army with weapons and equipment this year to help fight rebels. Chad is one of several states engaged in Western-backed operations against the Boko Haram armed group and fighters from the Islamic State of Iraq and the Levant (ISIL) group. Deby, one of Africa’s longest-serving leaders, took over the arid, impoverished nation in 1990 and won a disputed fifth term in April 2016.